These beautiful ceramic hanging decorations are carefully hand painted with the artist's representation mini portrait of your dog, a little red heart and the dog's name. 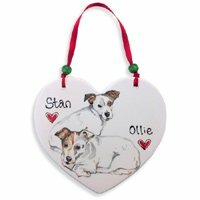 Available as a flat round decoration or a flat heart shape. 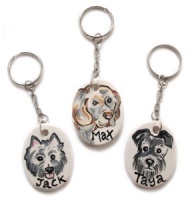 These make a truly wonderful decorative item or keepsake for any dog lover. A very unique gift to treasure forever. 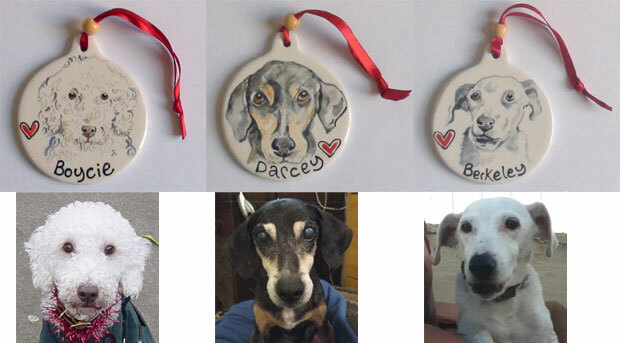 Choose from red, blue, pink or green for the hanging ribbon. The piece will be finished with a colour co-ordinated wooden bead. The round shape measures approx. 7cm diameter and the hearts are approx. 8.5cm in length and 7.5cm at their widest point. More examples of the artist's own personal painting style can be seen below. 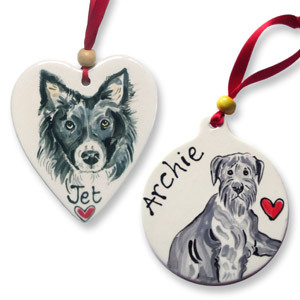 I ordered the ceramic heart in memory of my dog Archie who sadly had to be put to sleep. I'm really pleased with it. Such a beautiful keepsake. 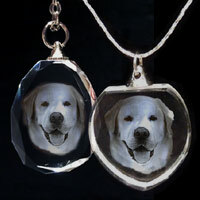 Our dog passed away recently, I found this and thought it would be the perfect gift to give to my mum as a mothers day present. I can't wait to give it to her, I know she will love it too!I also bought one for myself. I am so happy with the keyrings, both of them are so cute and the drawings are just beautiful. We are sorry that you were disappointed with one of the paintings. 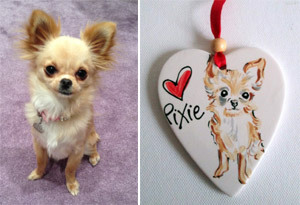 As per our emails, where we looked at this issue in detail, after comparing the painting with the photograph of the dog, the decoration has been painted in the style as shown. I am sorry if you were expecting something different. 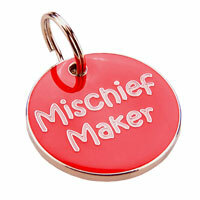 Bought two of these for the breader of my puppy's mum and dad. 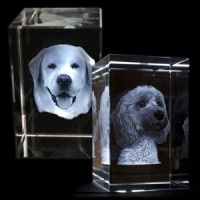 The pictures really captured the dogs. Very pleased indeed. Absolutely spot on painting of our dear departed Barnie. I bought 2 to give my grown up kids for xmas and am so delighted with the quality and presentation. 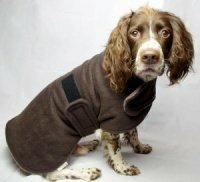 There was a slight hiccup with my order but it was rectified promptly so D for Dog also gets top marks for their customer service. Thank you. This was perfect, I loved it so much that I will be ordering another one as a gift. I was struggling with the loss of my 17yo dog and although I already had planted a tree I wanted something else I could take with me, the painting was so close to the photo I submitted, it arrived so quickly and I am really happy with the results, I've placed it in my car. 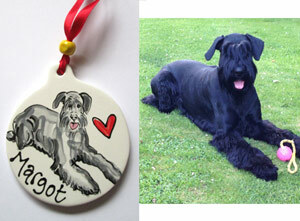 The likeness is beautiful. Wouldn't hesitate to recommend having this done as a memento keepsake to anyone. Thank you so much. 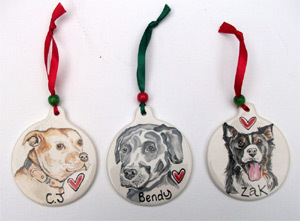 I am so chuffed with the personalised ceramic dog decorations I ordered. The miniature paintings taken from the pictures I emailed are spot on. Excellent quality. Beautifully wrapped. Thank you.